My day job called me to a conference in Orlando. The conference was productive, but there was still time to get in some good training, too. I thought the riding would be a traffic nightmare with all the Disney World traffic, but so many of the roads are three and four lanes wide that there is plenty of room for cars to pass. 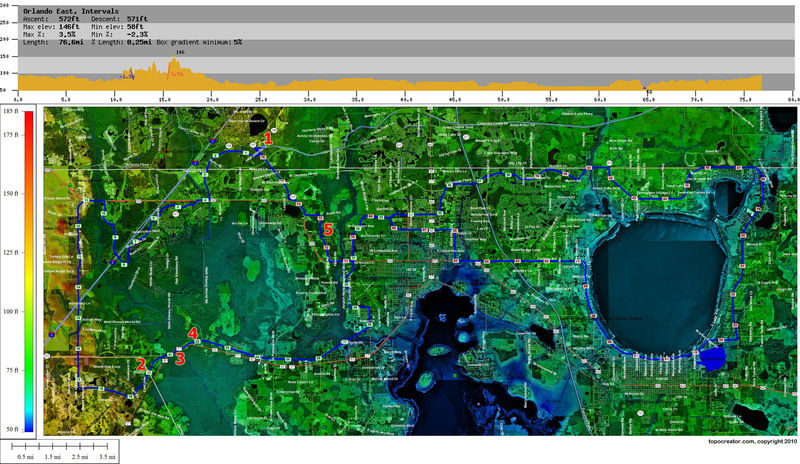 For my last ride (see map below), I headed northwest towards Clermont and was truly amazed at how hilly that section of Florida is. There was one hill about one half mile long with average gradient of 5% and steepest section of 12-14%. Plus, it was absolutely beautiful rural countryside. My favorite riding moment came Friday afternoon when I left a main highway to turn onto an “Old Hwy”. This road got narrower and narrower until eventually I passed a stone monument with the date 1930 etched onto it right at the entrance to a beautiful 1/2 mile stretch of brick road. I kid you not, it was beautifully connected brick road with no bricks missing and incredibly fun to ride over at 20+ mph! Then after I exited that section of road, I crossed a low-lying bridge through a thick swamp presumably with alligators immediately before turning onto another road where an Amtrak train was passing on railroad tracks parallel to the road I was on and only a few feet away. It was an amazing 1-2-3 punch all within about a mile of riding. Then towards the very end of that ride, when I was getting pretty exhausted from the heat, I rode through a one-lane newly paved road right through the middle of a “lake” on my Garmin, which was actually a swamp. The trees and water were so close I imagined an alligator hiding and jumping out at any moment. 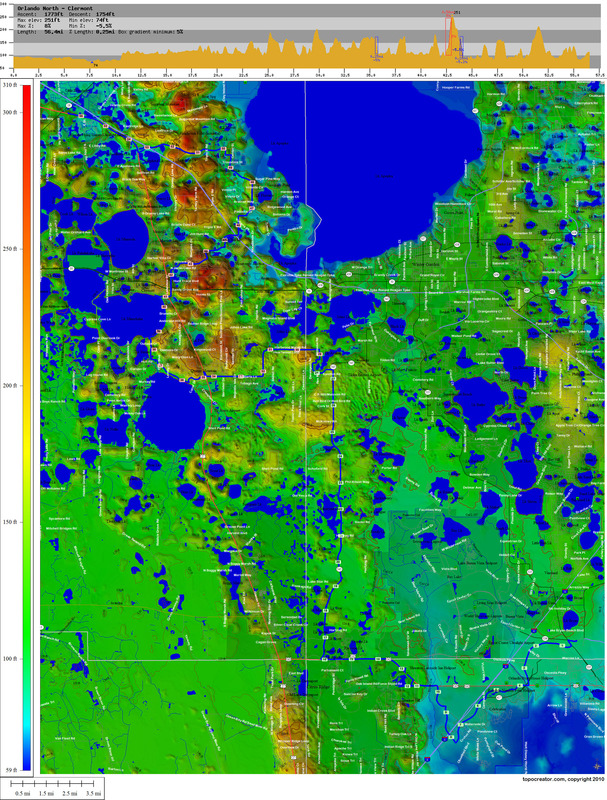 I’ve highlighted all of this on the third map below (Friday’s Swamp Ride). The only downside is that it was very hot and humid (temp in the 90s with lots of humidity). I ended up today back in Birmingham with 325 miles for the week, with 240 of those in Florida. Wednesday – Wintergarden Hills. Check out the hills in the northwest! Thursday – Poinciana Flats. Raced a major thunderstorm (and lost). 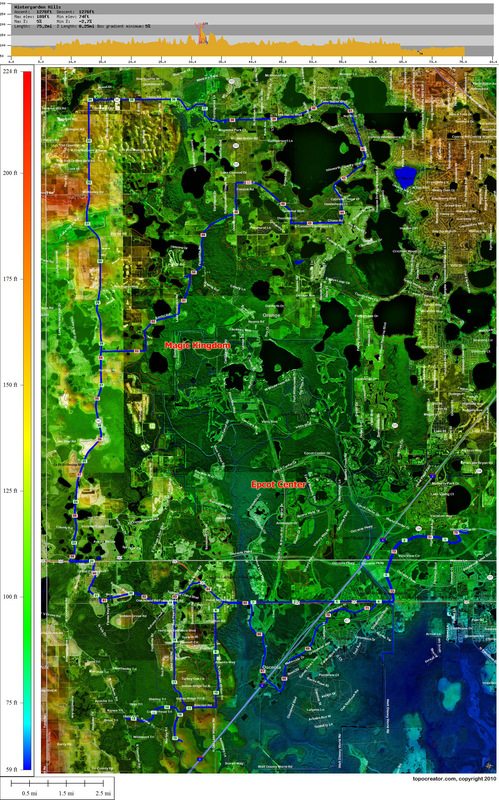 Friday – Swamp Ride Hard, hot intervals east of Orlando – I drank 8 bottles of water/gatorade on the ride! Saturday – Orlando to Clermont. Amazing hills and scenery in the northwestern part of the ride near Clermont. This entry was posted in Training and tagged topocreator on July 18, 2010 by kartoone.